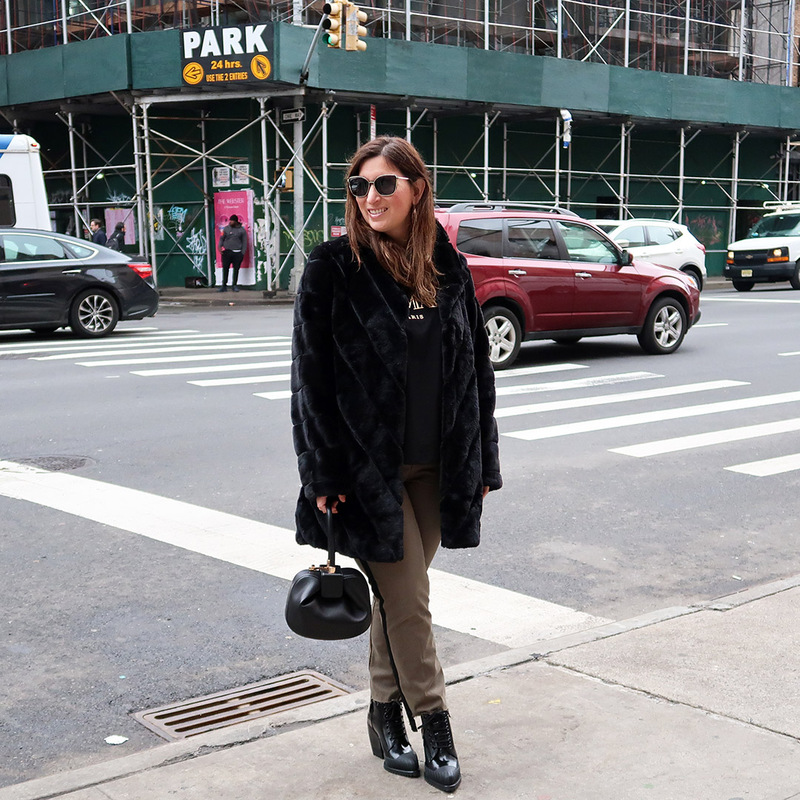 Have you ever put an outfit together for the benefit of your handbag? It is something I find myself doing quite often when I have a new handbag. I pre-ordered this Chloe Hudson in early summer, so now that I have it, I had to design my outfit around it. 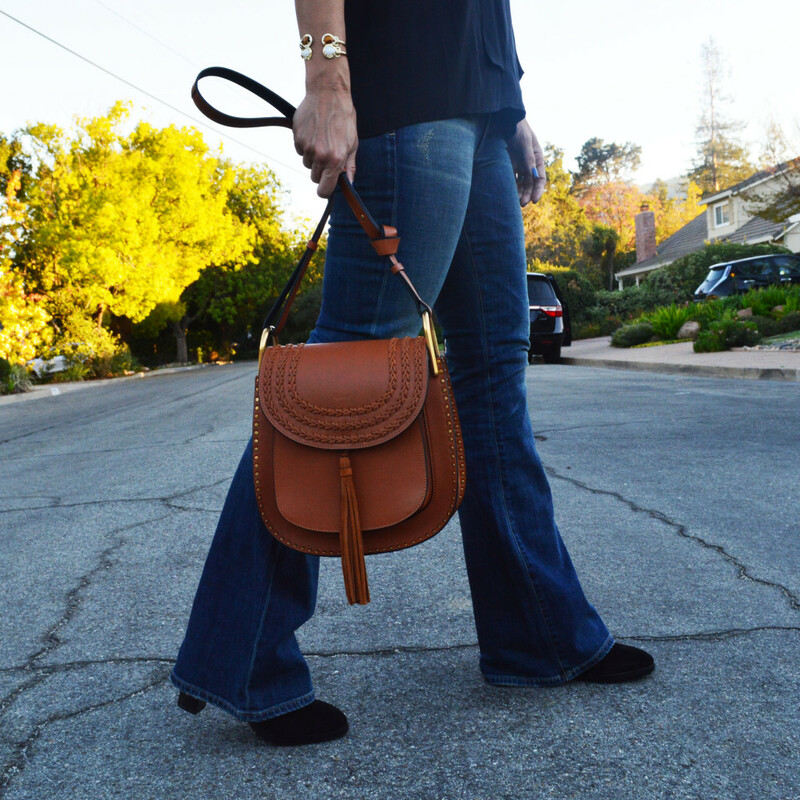 The Chloe Hudson has an obvious, 1970’s influence. 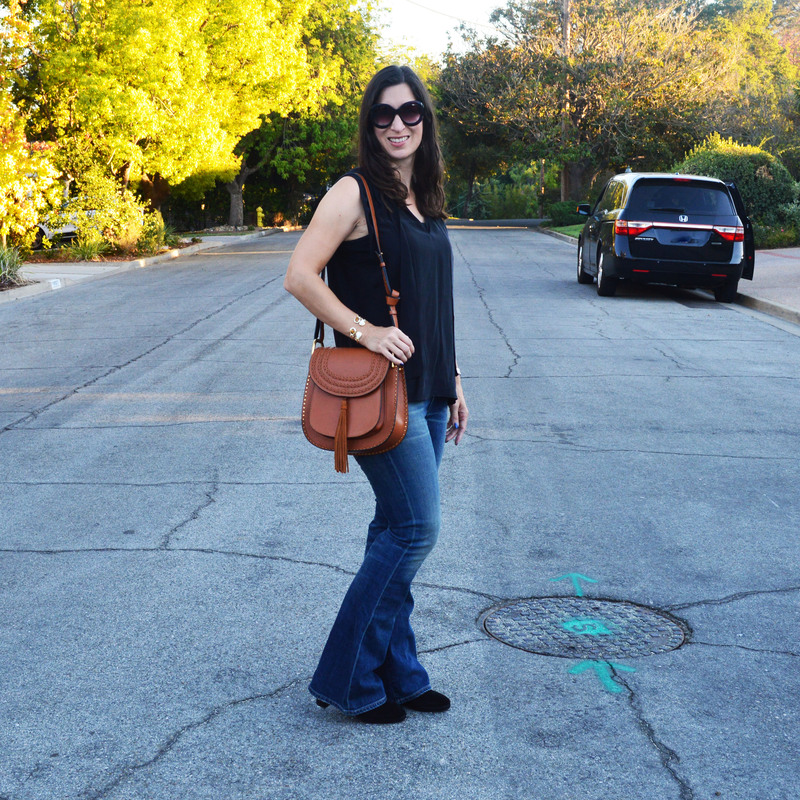 Since I wanted a casual look for the weekend, I decided to play off the 70’s style and wear my favorite pair of flare jeans. 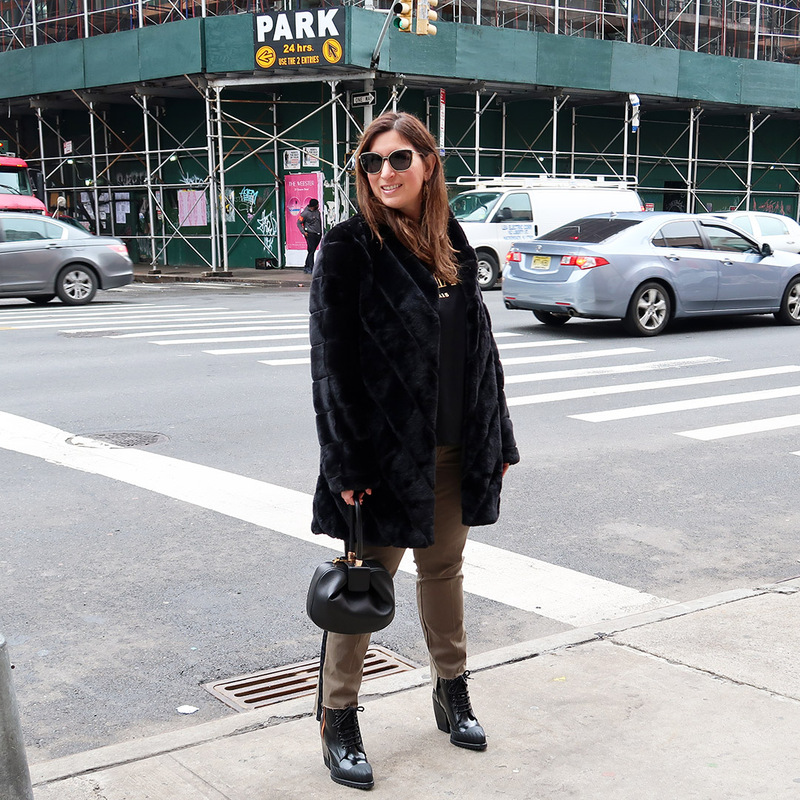 In order to not compete with the handbag, I paired the jeans with classic black boots, and my favorite black top; which I wore recently at fashion week, and find myself reaching for often. I thought the basic outfit would draw the eye to the handbag. 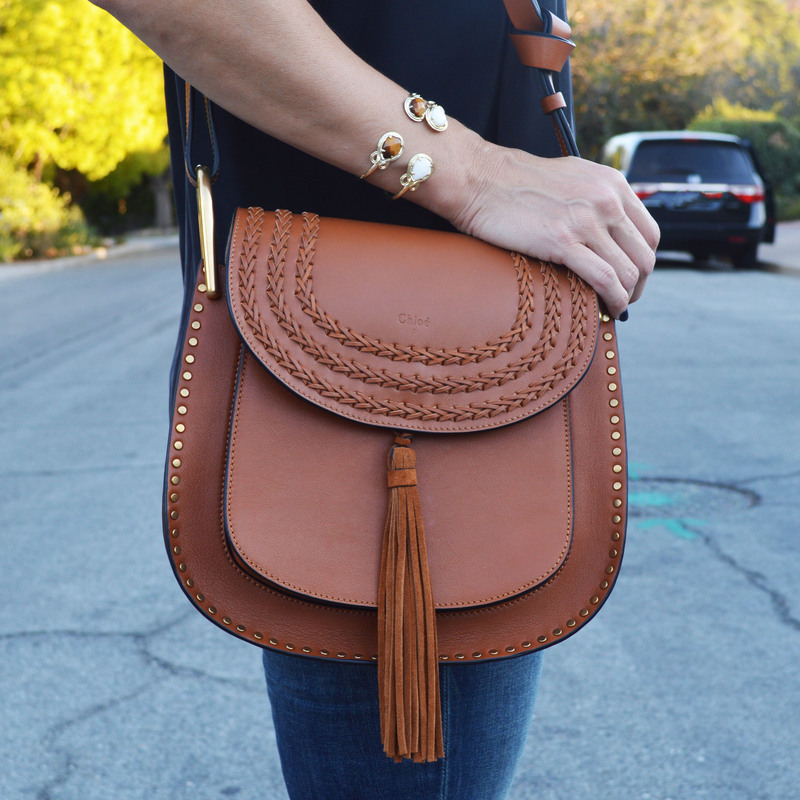 As you know, I love handbags; and Chloe is one of my favorite handbag designers. The Chloe Hudson first caught my eye when it sailed down the runway for fall 2015. I was excited when it became available for pre-order a few months ago. The original delivery date was in November, but thankfully, it came in September. I’m in love! I am looking forward to pairing my Chloe Hudson with a variety of looks this fall. 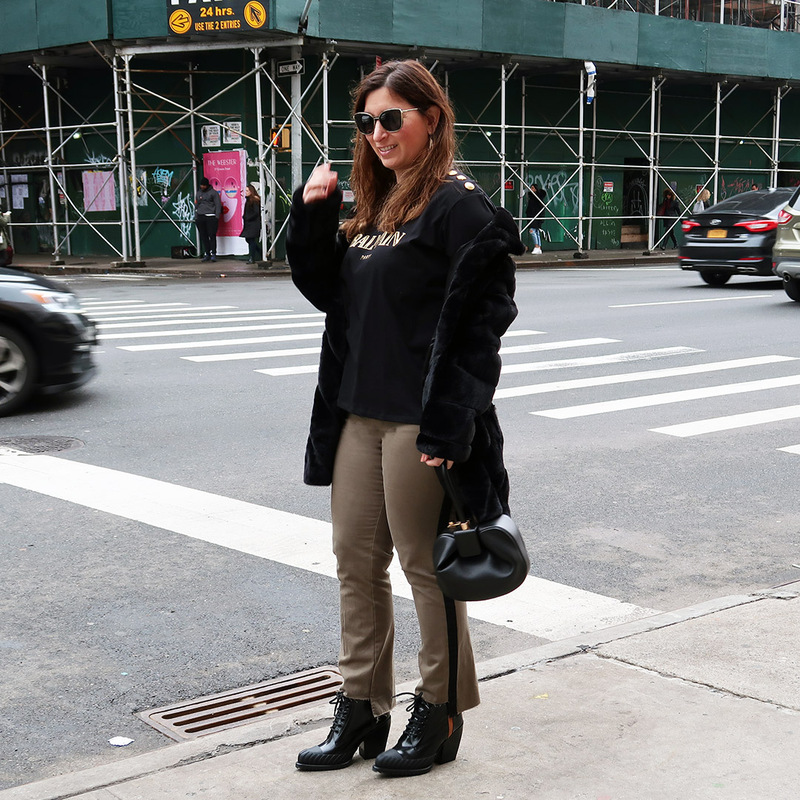 I have more casual outfits in mind, and cannot wait to pair it with my suede skirt, last seen here, and more! It also made an appearance on the spring 2016 runway, so this handbag definitely has longevity. Love that! For the fall and winter season, I also found I needed a new pair of black boots. I am thrilled to have found this classic pair by Tory Burch. The sole has a small lug sole which will be perfect in the winter season to help keep me from slipping on wet sidewalks, or icy surfaces. They may have to come with me to fashion week in February! 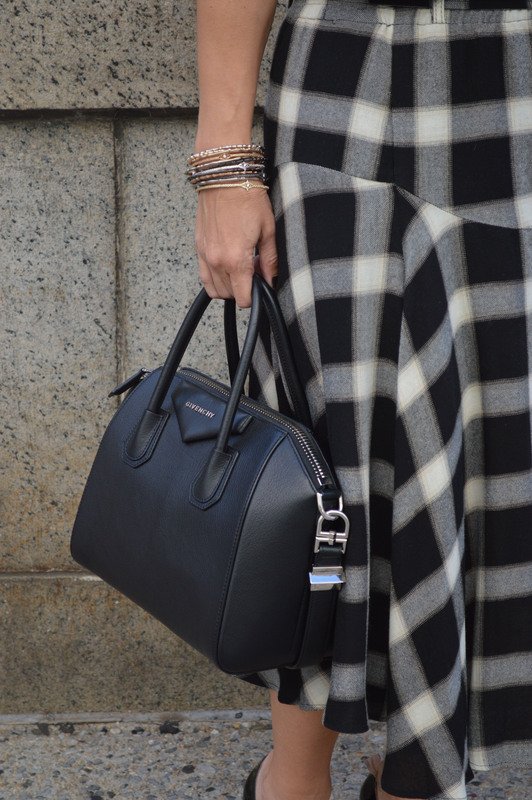 Do you ever find yourself designing your outfit around your handbag? 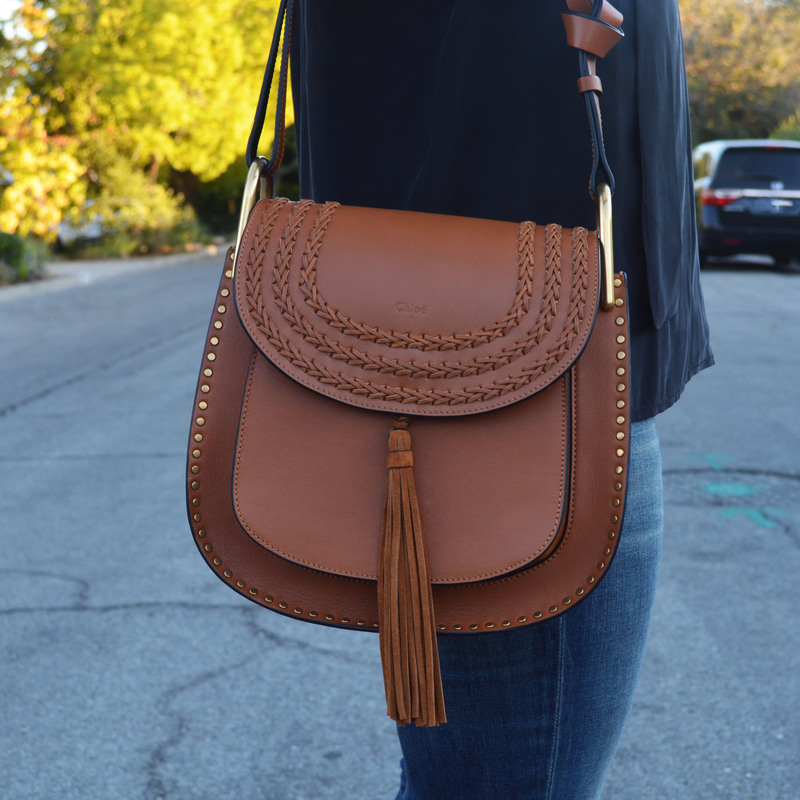 I will be reviewing my new Chloe Hudson later this week, so stay tuned for the upcoming post! 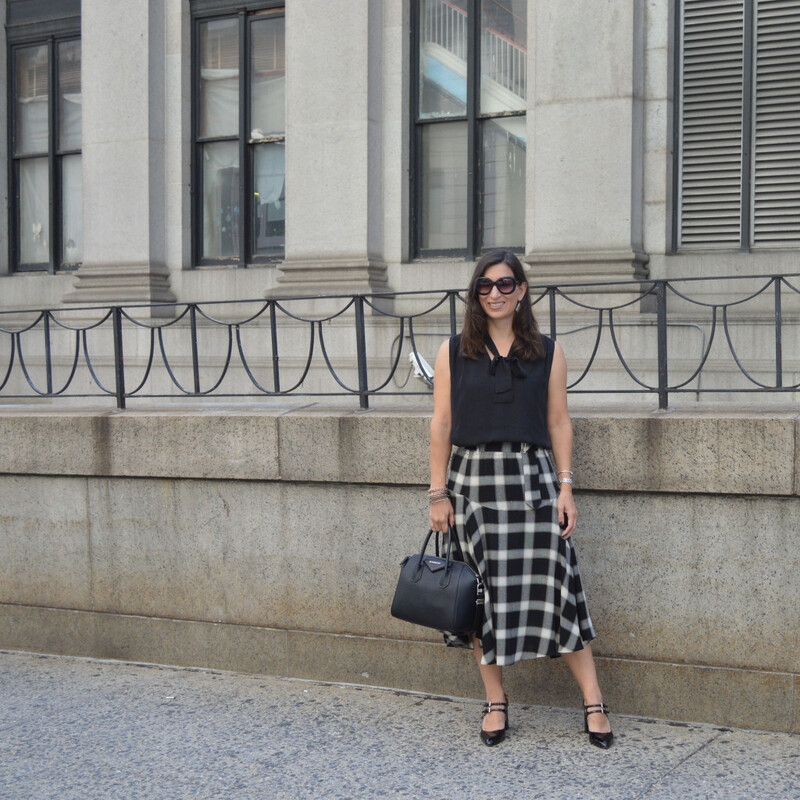 Plaid is a huge trend this fall, so when it came time to choose my outfits for New York Fashion Week, plaid seemed like a no-brainer! 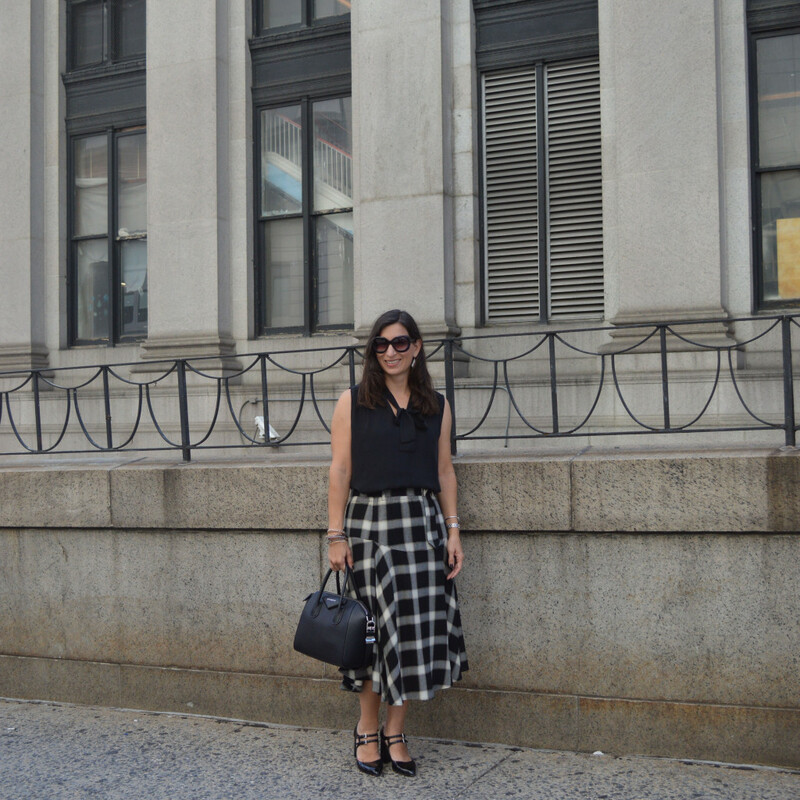 When I spotted this plaid skirt by ALC, I knew it was not only perfect for fashion week, it would be ideal for my fall wardrobe. Since the plaid has black, putty, and grey in it, I decided to pick up the black for my top. It felt “New York-ish” to me. 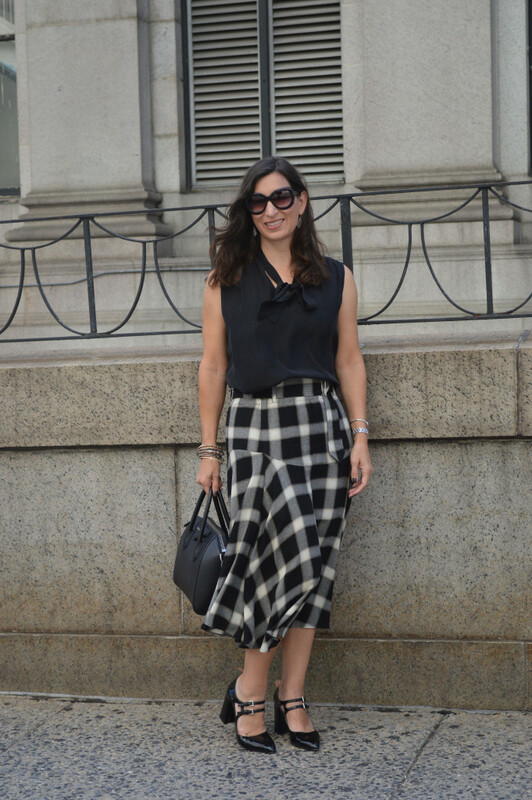 Here at home in the suburbs, I would prefer to add a pop of red to the plaid in the skirt for a top. Now, to find the perfect red top for this skirt. . . 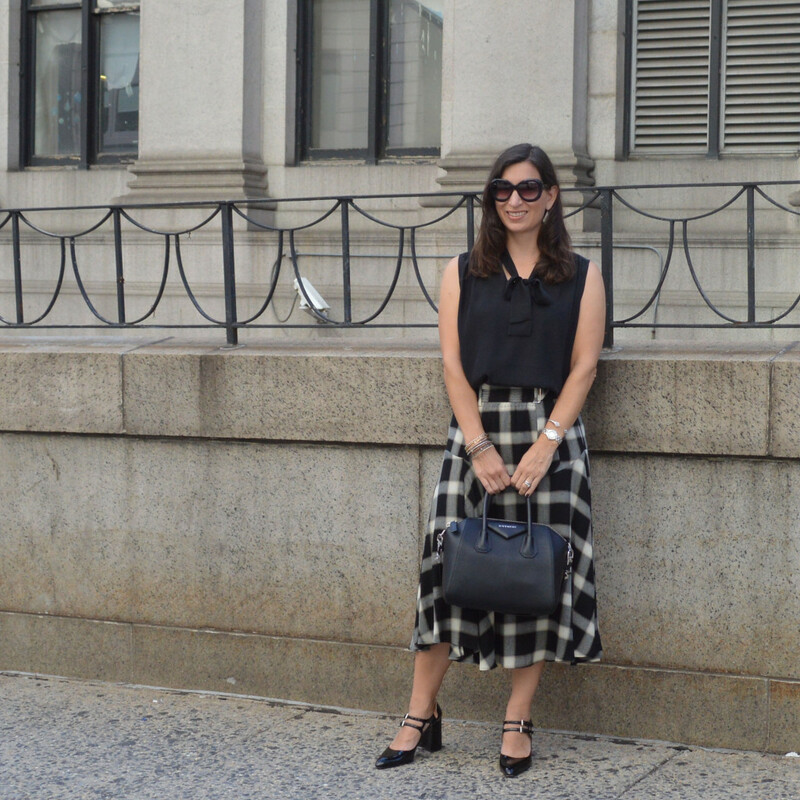 The sleeveless top is perfect for early fall weather. When the weather starts to cool down, the addition of a leather jacket is all this ensemble will need to transition to cooler weather. This top will also look cute with flare jeans and boots for casual fall days. 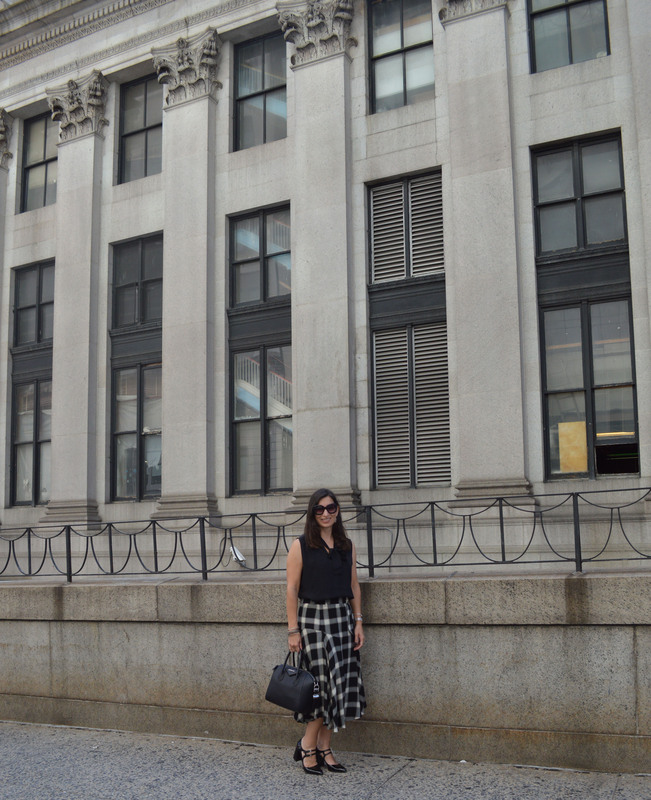 I wore this outfit on day four of New York Fashion Week in September. This was a busy yet fun day. I started the day off with Fashion Shenzhen, then attended RewardStyle’s Rooftop Party, then I had FTL Moda, Georgine, Vivienne Hu, and Art Hearts Fashion. Stay tuned for my coverage of these shows! 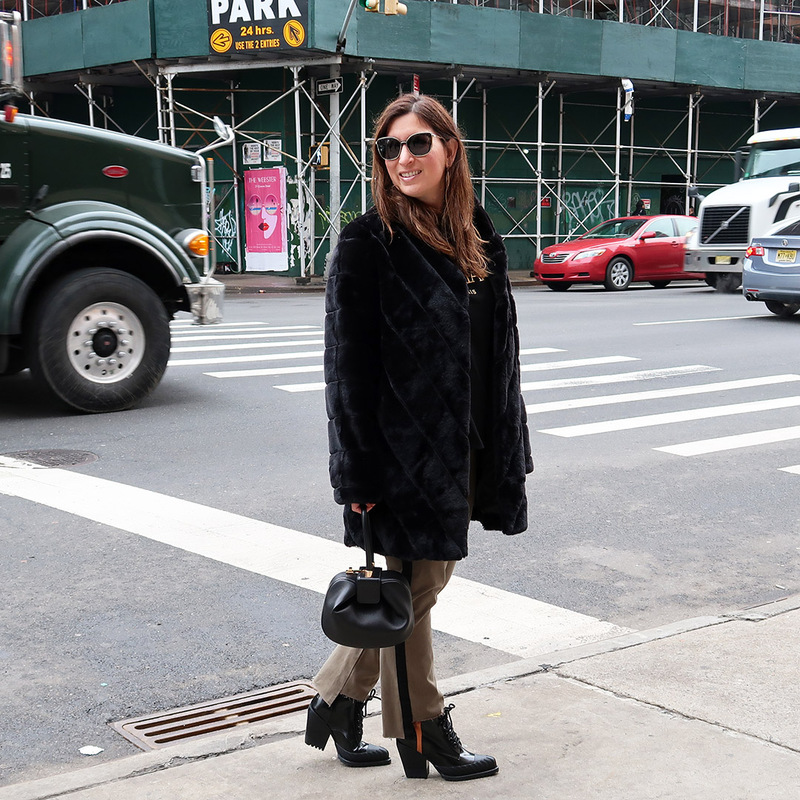 This outfit was easy to move in; making it ideal for a busy day of running around mid-town and lower Manhattan. The skirt was comfortable and cozy. I can imagine it in cooler weather with boots and a cozy, ivory sweater. Now, we just need some cooler weather here in the Bay Area!